Why am I hurting, and no one seems to know what is wrong? I believe that the answer is “Yes.” Thanks to observations gleaned from successfully treating thousands of painful joints with Prolotherapy, I think I have developed a fairly clear understanding of this disease process. Many of these observations have been made by others in the Prolotherapy community for decades. What has been lacking thus far is assembling these observations into a description of a disease process. That process can then be named and understood by the medical community, and the general community, in a way which explains the mystery of many misdiagnosed and undiagnosed body pains. To that end, here is an introduction to the Connective Tissue Damage Syndrome. To restate the problem, you have neck pain with some numbness and tingling in your thumb and first two fingers, or you have lower back pain with some aching pain down the lateral thigh and lateral calf and recurring back muscle spasms, or you are limping with hip pain. You go to the doctor and get an X-ray, and the film is completely normal or shows significant cartilage loss. Then, you walk into a room filled with practitioners—Orthopedic surgeons, Neurosurgeons, Neurologists, Rheumatologists, Physical Medicine/Rehabilitation doctors, Chiropractors, Physical Therapists, Massage Therapists, Family Doctors, Pain Clinic physicians, Acupuncturists, etc. You go around the room and ask a simple question. “What structure are these symptoms actually coming from?” You will get about forty different answers but the correct answer will be only one of these, or none of these. It is obvious that this is the most important question that can be answered if the patient is to be successfully treated. I would tell each of these people previously mentioned that every symptom they described is consistent with the Connective Tissue Damage Syndrome (CTDS) affecting various ligaments and tendons. And I would probably be correct. These scenarios represent real people who have been evaluated and treated successfully by this author. In order to understand this syndrome, which is not recognized or understood by most practitioners in this country, let us first touch on some medical history. Then we will look at the mechanism by which pain and other symptoms might arise from connective tissue damage, then catalog the symptoms and findings produced by this disease process. We will consider how these patients might be best evaluated and treated. Lastly, we will consider the origins of the confusion regarding this diagnosis. Until the 1950s, ligaments were believed to be a significant source of somatic pain—back pain, neck pain, and joint pain in general. There were at least two reasons upon which this belief was based. First, the nerve density in ligaments (and tendons) is very high. Damage in these structures would be expected to cause significant symptoms. Secondly, diagnostics were based on physical examination. The old dictum in Orthopedics used to be, “Get your history, do an examination, make a diagnosis, then confirm your diagnosis with imaging.” If you carefully palpate painful joints, necks, and backs, you will find that virtually all of the tenderness is noted over ligaments and tendons. And if you find these tender structures around a joint, it is no great leap of logic to conclude that these are the structures from which the pain is arising. However, this type of careful palpation is rarely a part of current evaluation. Also in the 1950s, injectable cortisone became available. It was found that injecting this medication caused improvement in many joint pains, leading to the theory of an inflammatory cause for these complaints, and ushering in the era of anti-inflammation. Current “conservative therapy” for joint, neck, and back pain is over-the-counter non-steroidal anti-inflammatory drugs (NSAIDs), followed by prescription strength NSAIDs, followed by corticosteroid injection. For any joint pain, regardless of X-ray findings, corticosteroid injections are often prescribed based on the idea that joint pain is commonly due to “inflammation.” If “nothing” is seen on imaging studies to “account for” pain, then the pain is assumed to be coming from local inflammation (bursitis or arthritis) or from an inflamed nerve. However we have arrived at this point, patients who arrive in my office with neck, back, or other joint pain virtually never say, “My ligaments are hurting.” What they usually say is that they have pain due to something seen on X-rays, or if “nothing” was seen on X-ray, they have been told that their pain is due to some form of inflammation or nerve pinch. But here is the problem. People have been treated appropriately for these “diagnoses” and they are not better. Often they are worse, after months or years of treatment. I see many, many patients with this story. This leads me to the inescapable conclusion that these people have been misinformed about the origin of their pain. If that is so, then where is their pain arising from? By what mechanism could ligaments, tendons, or other connective tissue cause pain? Ligaments are cables between two bones, allowing the bones to move relative to each other, with motion limited by the ligament. Tendons are cables between a bone and a muscle that allow the muscle to move the bone. These structures are virtually indistinguishable under a microscope and are made almost entirely of collagen. Ligaments and tendons are heavily innervated. Let us now apply this model for pain production to a common malady—tennis elbow. This condition is characterized by pain around the lateral epicondyle of the elbow when the extensor muscles of the forearm are used. Also characterized by pain when pressure is applied to the area (hurts when you use it, hurts when you press on it). This condition often gets better with anti-inflammatory medication and was deemed to be an inflammatory condition for many years. Hence, it was called “tendonitis” (or “tendon inflammation.”) This belief continued until a couple of decades ago, when biopsy studies showed conclusively that no inflammation was present in chronic cases of “tendonitis.” Instead, there was architectural disruption of the collagen fibers. In other words, there was unhealed damage (a non-load bearing connective tissue structure) that was producing pain. Based on this study, this disease was actually renamed. “Tendonitis” became “tendinosis.” Tendinosis is the term for degenerated tendon. Obviously signifying that regeneration is what is needed for the condition. 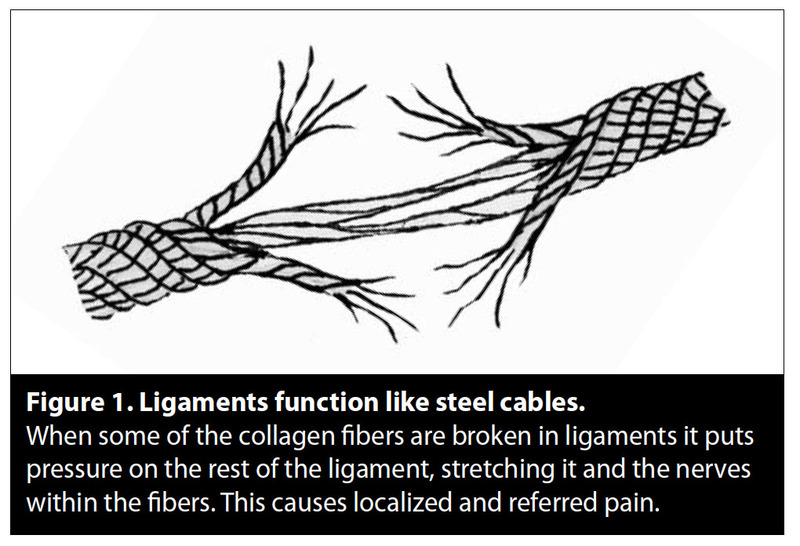 Ligaments and tendons are very similar in structure and function. Is it reasonable to assume that a ligament might be subject to the same kind of painful damage that in a tendon is called “tendinosis?” Of course this is reasonable. What is the name of this condition in a ligament? I often ask my patients this question and it is amusing to watch them struggle with it. Eventually everyone stops trying to recall an answer. I then tell them that they are correct. This disease entity does not have a name, yet I treat it every day. Perhaps it would suffice to say the person simply has degenerated ligaments or ligament damage? The fact that anti-inflammatory medications “work” in reducing pain in these conditions is important and will be discussed later. Also worth emphasizing at this point is the fact that the medical community thought that this manifestation of the Connective Tissue Damage Syndrome was an inflammation but it is not. This mistaken assumption shows up time and time again in other body tissues (e.g. a “bursitis” diagnosis when there is CTDS in the ligaments of the hip or shoulder). What symptoms are possible due to small-fiber nerve damage in connective tissue structures? The following list encompasses many common symptoms. Upon what evidence do I base the assertion that small fiber nerve damage in ligaments and tendons produces the above clinical manifestations? The entire discussion is beyond the scope of this publication, but in brief, Prolotherapy only modifies one variable, for the most part, which is the amount of collagen in structures. Also, in administering Prolotherapy, I inject a proliferant solution which contains lidocaine. Therefore, I sequentially subtract out symptoms from connective tissue structures during a treatment. Suppose one of the patients previously described, who comes to me with low back pain and aching pain down the lateral thigh and lateral calf, has been told that his back pain and referred symptoms are due to “a bulging lumbar disc and pressure on nerves in the back.” Yet on physical examination I find a group of tender lumbar ligaments, and I find significant tenderness in the upper sacroiliac ligament on the same side as his lower extremity referred symptoms. I could theorize that his pain and referred symptoms may be due to CTDS in his ligaments. My theory at that point should be accorded no more weight than any of the myriad other possible theories for the origin of his symptoms. If however, I treat him with Prolotherapy, subtracting symptoms from each ligament structure for the duration of the action of the lidocaine, and all of his symptoms, including his referred symptoms, resolve immediately, then the argument is considerably stronger that the correct pain-causing structures have been identified. Further, although symptoms return after the local anesthetic wears off, if those symptoms are permanently relieved after three or four Prolotherapy treatments, then one can reasonably conclude that it was a lack of collagen in these structures that lead to this patient’s symptoms in the first place. And, if my success rate for treating patients with back pain with an array of previous diagnoses, who have tender ligament and tendon structures in the back, is upwards of 85%, then it could be plausibly argued that this is the correct diagnosis in everyone who completely responds to Prolotherapy. Certain symptoms and findings of CTDS noted above merit further discussion. First, structures with CTDS are always tender to palpation (Item 3) whether pain or other symptoms are present or not at the time of examination. This is how you locate this tissue damage. Conversely, probably 90% of the symptomatic connective tissue damage that I treat does not show up on any imaging study. Thus, will practitioners who base their diagnosis on imaging studies ever correctly identify this type of damage? Secondly, muscle aberrations (Item 4) frequently drive people to seek manipulative therapies. If muscle function problems are recurrent or chronic, there is almost always tendon damage involved, or damage in a ligament near a tendon insertion. Once this damage is rectified, the secondary muscle manifestations completely resolve with no further treatment. This is true with decreased range of motion in the cervical spine, shoulder, back, and hip, as well as painful knots of muscle between the shoulder blades, back spasm, “chronic hamstring pulls,” etc. by feeling a point of pain in the head or neck, just prior to onset of a severe headache. All of the Barre-Lieou symptoms may be very successfully treated with Prolotherapy of the neck ligaments. Connective tissue-triggered migraines may be successfully treated by treating the specific connective tissue trigger point or points. Symptoms of CTDS tend to fluctuate (Item 7). They may be intermittent. Precipitating factors for an exacerbation of symptoms include load-bearing on the structure (Item 1), stress, including lack of sleep, and falling barometric pressure. As ligaments become non-load bearing, yet continue to bear weight, they will stretch and become longer. This causes the bones connected to the ligament to develop abnormal mobility. This abnormal motion has several consequences. 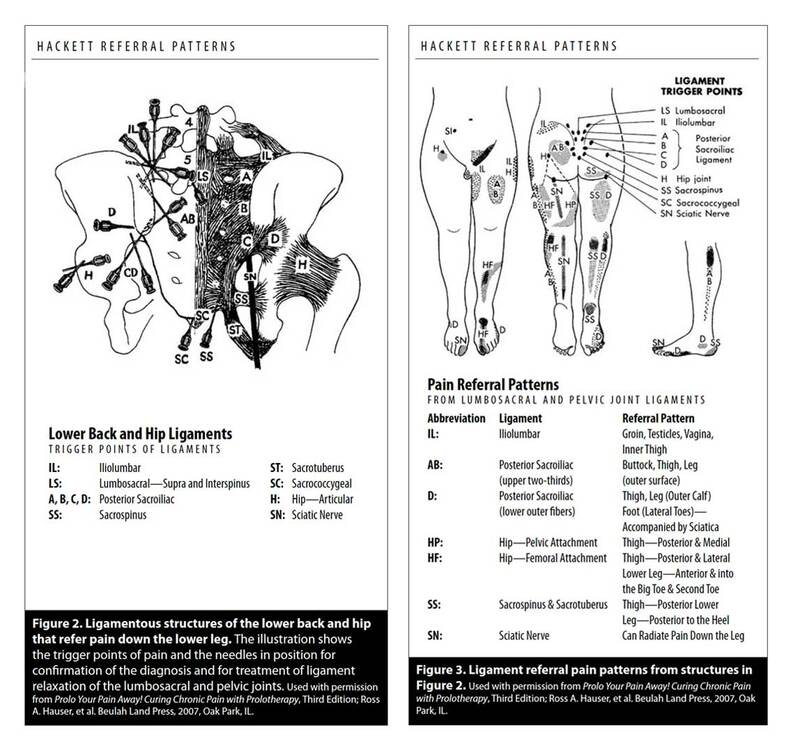 The relationship between ligament damage (laxity and elongation) and these secondary manifestations is often missed. This is particularly true with arthritic joint changes and degenerative disc disease. Abnormal impact on a bony surface is a stimulus for new bone formation. Joints with “play” in them, which allows such impact, would be expected to display evidence of osteogenesis (new bone formation). If an X-ray of a joint is obtained, and loss of cartilage and osteophyte formation are noted, a diagnosis will be assigned—“arthritis” or “joint inflammation.” Most practitioners assume that the pathology and the pain of arthritis reside in the joint surface, and that the cause of this pathology is inflammation (hence the suffix “itis”). However, careful palpation around virtually any osteoarthritic joint will reveal tenderness in the ligaments. Further, injection of these ligaments with local anesthetic will generally dramatically reduce, or eliminate, the joint pain in the moment. While inflammation is seen on damaged cartilage surfaces, this inflammation is likely not the cause but a result of cartilage damage due to abnormal joint motion, due to abnormally long ligaments. While osteoarthritis is a multi-factoral disease, it is safe to say that the role of ligaments in the genesis of this condition, and as the origin of symptoms, is underestimated. In a similar manner, damage to the meniscus is generally preceded by laxity of the ACL, evidenced by a positive anterior drawer sign. Tearing of the labrum is accompanied by laxity of the glenohumeral ligament, which is evidenced by significant tenderness in this ligament and abnormal humeral head mobility. Bulging and degeneration of the intervertebral disc is preceded by non-load bearing status in the facet and supraspinous ligaments, evidenced by significant tenderness in these ligaments. If you do not believe this, assess laxity and tenderness in these structures the next time these injuries present, then judge for yourself. What is the body’s defense against the Connective Tissue Damage Syndrome? Collagen repair, which is handled by two distinct healing systems. In actuality, these represent ends of a continuum but they appear on observation to be two distinct systems. First you are in a continual tug-of-war between damage and healing. Every day you do molecular level damage to structures when you get out of bed. If you work hard, or work out, you will do more damage. Your body is supposed to repair this damage on an ongoing basis and make structures stronger as necessary. The repair system responsible for this daily, ongoing repair will be referred to as the “Wear and Tear Healing System,” or W/T HS. The second line of defense is the Acute Injury Healing System (AIHS) which can be observed in operation following major surgery. This system is not “turned on” continuously. It must be triggered by specific factors, and collagen production lasts for about six weeks. It is capable of huge feats of healing. The trigger for this system is a group of chemicals which reside in white blood cells and platelets, collectively called “growth factors.” If these growth factors are released in adequate amount from white blood cells and/or platelets, this six week healing sequence turns on and runs to completion. Prolotherapy is the art of prompting white blood cells and/or platelets to release growth factors and to trigger the AIHS, thereby making possible, huge feats of healing in damaged ligaments, tendons, and other connective tissue structures. It should be noted that Prolotherapy is the only medical specialty devoted to employing this healing system to treat connective tissue damage. What controls the Wear and Tear Healing System, or W/T HS? A surveillance system is needed which is capable of identifying degrees of local “wear and tear” damage, then responding by triggering the repair process. The white blood cell is the logical mediator for this process since it contains the growth factors, and since its function is to scan the local environment to communicate with other cells in response to various changes in this environment. My theory is that the white blood cells are capable of “reading” the amount of cellular breakdown products in their vicinity. Then they measure out growth factors commensurate with the quantity of these breakdown products. 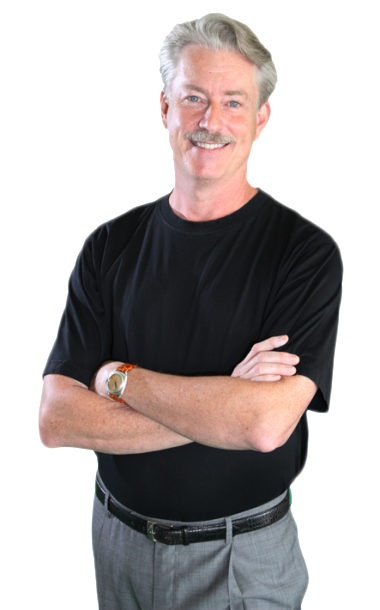 The main event in both systems, from the standpoint of connective tissue healing, is the summoning and activating of fibroblasts, cells which make new collagen. Most joint pain resolves because the W/T HS takes non-load bearing, painful connective tissue and heals the damage. But this system only has so much healing potential. What happens if a structure accumulates more damage than this system can repair? You develop recurring, or chronic symptoms, which may worsen over time as you continue to use a weakened, vulnerable structure. The Connective Tissue Damage Syndrome model—pain and other symptoms due to weakened connective tissue, resolution of symptoms due to repair of connective tissue, repair of connective tissue accomplished by the body’s own healing system—easily explains a number of phenomena that baffle patients and practitioners. What factors might lead to lack of connective tissue healing? As mentioned, connective tissue healing is a white blood cell function. Though a full discussion of these next two factors is beyond the scope of this publication, they are testosterone and human growth hormone. In order to have proper connective tissue healing, all three factors must be in place. 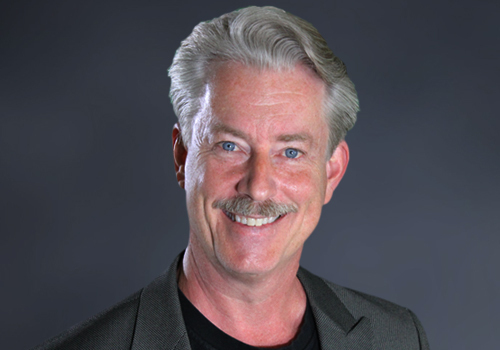 In my experience, lack of testosterone drive for connective tissue healing is rare, but possible, in males. It is quite common in females, and may not be at all coincident with menopause. A deficit in connective tissue healing due to lack of Human Growth Hormone is occasionally seen with a severe sleep disorder. What would impair output of growth factors by white blood cells? Curiously, the very treatments most commonly employed for connective tissue injury will accomplish this—ice and NSAIDs. Corticosteroids will accomplish this more powerfully and the effect lasts far longer. Also, anything that diverts significant “immune attention,” such as a severe, unrecognized food allergy, or a chronic infection, can impair connective tissue healing. Therefore, if someone has a factor which impairs connective tissue healing (e.g. lack of testosterone, chronic NSAID use or corticosteroid use) this disease model predicts that such a person could easily develop recurring or chronic symptoms in spite of (or because of) the treatments commonly offered for these kinds of symptoms. If you want to stop these symptoms, you must activate and optimize the person’s connective tissue healing system(s). How do patients present with the CTDS, and how will you know it when you see it? It is relatively easy, given the above discussion, to understand why a person might undergo shoulder arthroscopy for a bone spur, yet still have pain a year later. The person probably had CTDS in shoulder tendons and ligaments. To find the structures with CTDS, you simply note every tender ligament and tendon in the shoulder on physical examination. Treating the tender structures with Prolotherapy has a very high likelihood of curing this person’s shoulder pain. More interesting are patients who present with back pain, numbness and tingling going down the outer thigh and calf, back spasms, and MRI findings of disc bulging, degenerative disc disease, and arthritis of the spine. These patients have usually been told that their referred symptoms are due to “sciatica” (or pressure on the sciatic nerve), and that their back pain is arising from their discs or from pinched nerves. In the vast majority of these patients, all their symptoms are due to CTDS. Treating the tender ligaments in the spine and sacroiliac complex will totally cure symptoms in the vast majority of cases. Even more interesting are people, usually women, who present with “multi-site connective tissue pain without trauma.” That is they have pain in several sites without an injury to account for the connective tissue damage. These people have often been told that they have “Fibromyalgia.” What they have is a W/T HS that is not working correctly, so that they accumulate damage in ligaments, tendons, and other structures, and develop pain in these various structures. Treatment of these people requires more than triggering healing in damaged structures. In addition, the factors that are keeping their connective tissue healing system from working must be identified and, if possible, rectified. This may be as simple as stopping regular use of NSAIDs, or it may require hormone testing and Bio-Identical Hormone Replacement, or it may involve more extensive testing and treatment. In most cases though, these factors can be rectified and healing can be accomplished. Evaluating patients for the Connective Tissue Damage Syndrome requires the following steps. First, a practitioner must realize that this disease exists and understand its possible symptoms and findings. Secondly, one must compare the patient’s complaints with those that could be produced by the CTDS. If there is the possibility of CTDS, the structures which might be potentially damaged are determined. A thorough history is obtained—the mechanism of injury, if any, the location of the pain and other symptoms, and the location of any malfunctioning muscles. Thirdly, using knowledge of anatomy and symptom referral patterns, the likely candidate structures are examined in turn. Tender structures are mapped for treatment planning and for future reference to assess treatment results. Fourth, the competence of the healing system is assessed. Factors that may impact the healing system are noted—medications, injury-treatment strategies, possible medical or hormonal problems, etc.—and appropriate testing and treatment are offered. If connective tissue damage is due to undue stress on structures (e.g. bad weight lifting technique, poor posture at the computer), or from abnormal structure (e.g. scoliosis), these factors are identified and patients are counseled regarding strategies to minimize future connective tissue damage. Prolotherapy is the treatment of choice for CTDS. 1. It takes much more time to take a good history and to do a good physical exam than it does to make a “diagnosis” by looking at an X-ray. I spend about an hour with each new patient. Although I often look at imaging studies, I have not changed a single treatment plan because of something seen on an imaging study. 2, Physicians misinterpret tenderness on physical examination as inflammation. 3. The various theories about causes of pains (that are actually due to CTDS) are simply that—untested theories. These theories were not embraced based on evidence, but unfortunately they took firm hold in medical thinking. In contrast, the medical literature as a whole presents a very strong case that all of these theories of the sources of joint, neck, and back pain are deficient. Yet doctors, being human, know only what they have been taught and they will try to fit your complaint into one of the diagnostic categories that they “know about.” “If your only tool is a hammer, all the world is a nail.” Put more gently, doctors will not look for something that they are not aware exists, and they will not recognize it when they see it. Fundamentally, this is a paradigm, or mind set, issue. The Dean of Students at my medical school (University of Alabama) said it best. “During your medical school education, you must keep one thing in mind. Forty percent of what you are going to learn is wrong. At this point, we do not know which forty percent. You must never stop learning.” I suppose I have taken his advice by changing careers from Surgeon to Prolotherapist. In summary, if one wants to assess the presence or absence of the Connective Tissue Damage Syndrome, the most important principle is to understand the symptoms and findings of this disease. The second principle is to understand the significance of tenderness during palpation of ligaments, tendons, and other connective tissue structures. This means that connective tissue structural damage is present. It must again be emphasized that this finding does not represent inflammation. I treat every tender connective tissue structure in any area where treatment is requested. The third principle is to understand that the cure for this disorder resides in the patient’s own healing system. Impediments to connective tissue healing must be removed (e.g. NSAIDs, corticosteroids, ice, etc.) and healing system function may need to be maximized using Prolotherapy. Occasionally medical issues which impair the connective tissue healing system may need to be rectified (e.g. testosterone deficiency). If these simple principles are kept in mind, the millions of people in this country who are suffering activity altering pain due to the CTDS can be accurately diagnosed and effectively treated in an extremely cost-effective way. Imaging studies are largely unnecessary for diagnosis. Many operative procedures can be replaced by a more effective, and more safe, non-operative treatment, Prolotherapy. And many medications, particularly anti-inflammatory medications which often worsen the very condition they purport to treat, can be replaced by therapeutic strategies which offer cure of the actual disease process.